In a time when shrinking budgets are adversely impacting education at all levels, educators and officials at all levels are often forced to think outside of the box to make ends meet. An increasingly popular method of doing so is crowdfunding—raising money from a large number of people, usually in small increments, via the Internet. This method of raising funds even made headlines this week as teachers in Philadelphia's cash-strapped public schools system took to the Web to find funding in a district that wasn't even sure it could open on time a few weeks ago. 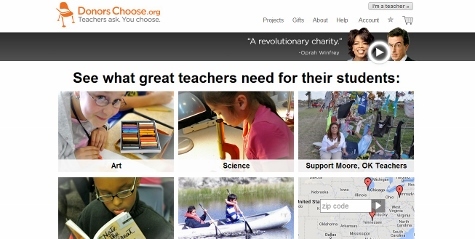 A number of options are available for educators looking to venture outside of the typical realm of Kickstarter and Indiegogo. Whether you're in a K-12 classrooms or a university research lab, one of these options may be just what you're looking for to fund everything from paper and crayons to tomorrow's next big discovery. With Adopt-A-Classroom, donors can choose any underserved classroom at any school of their choosing to donate to—or, if they don’t have a preference, the organization will partner that donor with a classroom. 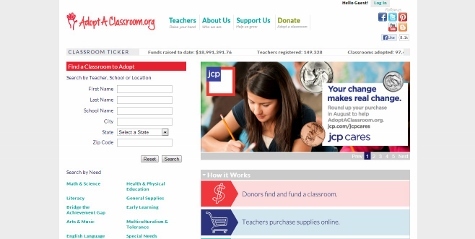 The entire donation is earmarked for a teacher in the form of credit, and Adopt-A-Classroom delivers an “Impact Report” to donors detailing exactly what the money was used for. The donors are also in contact with teachers throughout the school year and often receive thank you packages, artwork and other projects from students. Some donors even chaperone field trips and other activities. The organization also has national partners that include OfficeMax, J.C. Penney Cares, Coach, Allison+Partners, Carmichael Lynch and Preston Kelly. Created by two English teachers at Oregon’s Clackamas Community College, IncitED launched in April as an education-specific answer to Kickstarter and Indiegogo. Founders Kevilina Burbank and Jaime Wood say they were inspired to start the IncitED after seeing too many education projects on non-specific funding sites go nowhere. Though it is still in its Beta, the site has already hosted several campaigns, ranging from a prospective private school in Texas to a St. Louis nonprofit hoping to inspire the next generation of technological innovators. 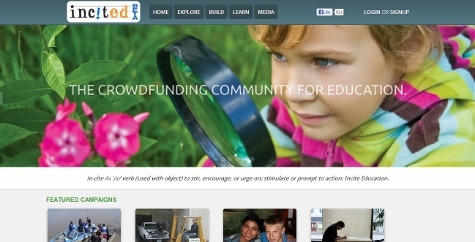 Also launched this year, CrowdFundEDU allows users to raise funds for anything related to education and has been featured on NBC, CBS, ABC and Fox News. Much of the coverage of the site seems to be focused on students hoping to raise funds to pay tuition or student loans, and most of the current projects are centered on the same thing. That said, an Italian e-learning platform and a magic camp for elementary-age children are among other projects seeking funding on the young crowdfunding platform. With state funding to universities shrinking, crowdfunding could become a more important means of funding tomorrow’s discoveries. Named for a symbiotic, microscopic fungus that supports entire ecosystems of roots, shrubs and trees by processing nutrients, fighting pathogens and stabilizing soil, Microryza helps researchers secure microgrants to support their work. Unlike other crowdfunding sites, however, Microryza’s projects don’t provide rewards to donors, as the site believes that the true value of the donation is in the process and outcome of research. Current projects include a hands-on paleontology experience for K-12 science teachers and an ocean acidification experiment that will see San Diego high school students collect and analyze water samples. Founded in 2000 by Bronx social studies teacher, Donors Choose was crowdfunding education before “crowdfunding” was a term. The 501(c)3 charity is also one of the best-known of these sites—celebrities like Oprah Winfrey and Stephen Colbert are among its supporters—and allows public school teachers to post requests for funding. These requests can be for everything from pencils to microscopes, and photos of the items in use or project in progress are provided to donors along with a cost report detailing exactly how the money was spent. Donations of $50 or more also result in hand-written thank-you notes from students, and the site reports that 70% of projects hosted are successfully funded. Would you like to see more education news like this in your inbox on a daily basis? Subscribe to our Education Dive email newsletter! You may also want to read Education Dive's look at 5 programs putting iPads in students' hands this fall.